Note: The pattern does not need a border. It lies flat without one. 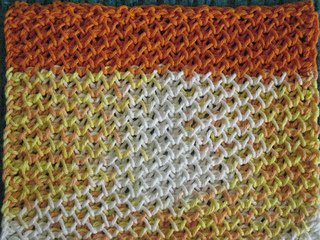 I started out with leftover creamscicle yarn and finished off with leftover orange. I thought about reknitting it in just one color but decided that leaving it as is would show how the pattern looks in both solid and variegated yarns. I generally use a size 6 needle with this yarn but needed to drop down to a size 5 for the pattern.